It’s a battle of the blondes, as Bootie mashes up two divas from the past two decades with all genres and eras! 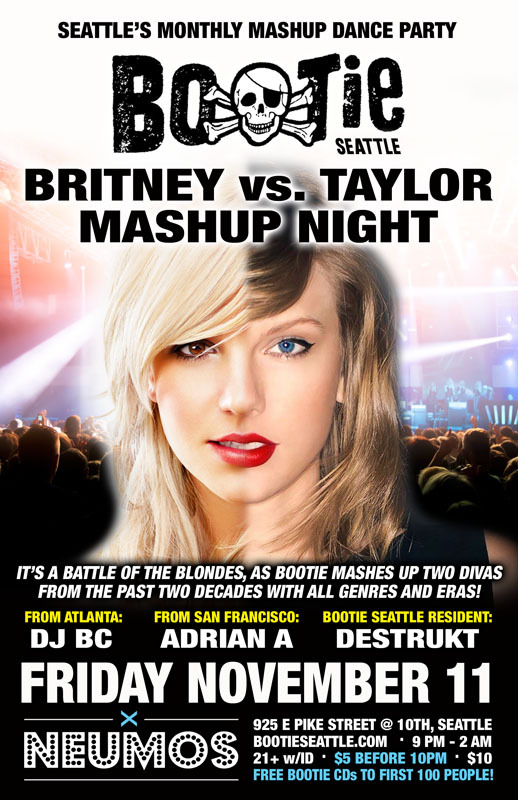 Bootie pays tribute to two of today’s modern divas, by having them battle it out at the club for mashup pop supremacy – it’s Britney vs. Taylor! Special guest DJ BC (Bootie Atlanta / Bootie Boston) joins Bootie co-founder Adrian A (from San Francisco) and resident DJ Destrukt, as they spin the best songs Britney Spears and Taylor Swift have ever created — from big hits to deep cuts — and giving them the Bootie treatment by mashing them up with anybody and everybody!